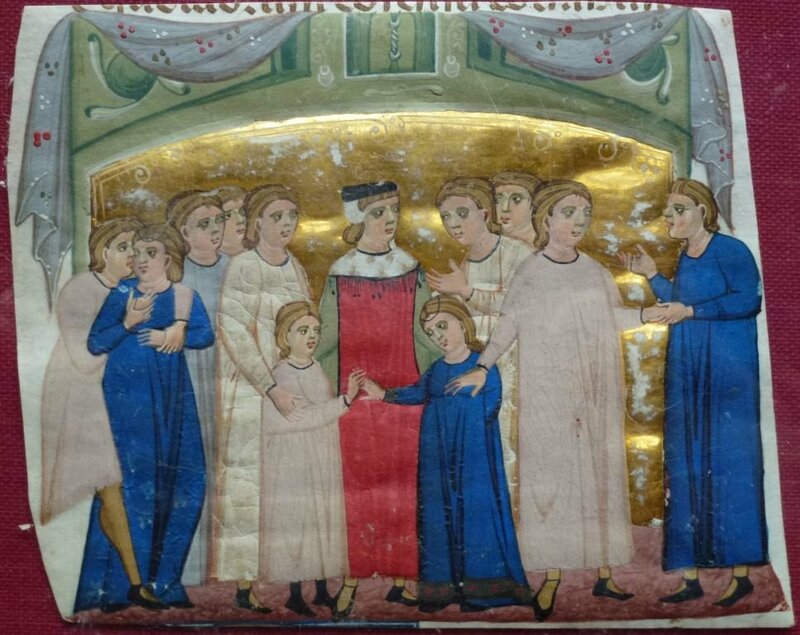 The Decretum Gratiani is the most important work written about Canon Law in the Middle Ages. Written in two versions by Gratian, a scholar and Bishop of Chiusi who died in 1144 or 1145, the Decretum was a widely influential work that examined the laws of the Catholic church. One of the most interesting sections in the Decretum is where Gratian offers 36 imaginary scenarios, and asks his readers various questions based on them. As scholars believe his work was meant to be a textbook for the classes Gratian taught at the University of Bologna, these scenarios can be seen as vivid examples that could perk up the interest of even the most bored student. Since he did not have a wife, a man joined a prostitute to himself in marriage. She was infertile and the daughter of a serf and the granddaughter of a freeman. Although the father wanted to give her to another, the grandfather joined her to this man, for the reason of incontinence only. Thereafter, the man, led by regret, began to attempt to conceive children with his own maid. Afterwards, when he had been convicted of adultery and punished, he asked a man to take his wife by violence, so that he would be able to divorce her. When this had been done, he married an infidel woman, but on the condition that she converted to the Christian religion. Now it is first asked if it is licit to take a prostitute as a wife? Second, if she who is taken [as a wife] for the reason of incontinence is to be called “wife”? Third, whose judgement would she follow, the free grandfather or the servile father? Fourth, if he is allowed to conceive children with a maid while his wife is alive? Fifth, if she who suffers violence is proven to have lost her virtue? Sixth, if an adulterous man can divorce his adulterous wife? Seventh, if a man may marry another while his divorced wife is alive? Eighth, if a Christian man may take in marriage an infidel under the aforementioned condition? No answers are given in the text – however, one could imagine that they sparked an interesting debate in the classroom.